This inn is housed in a 15th-century building, in the village of Murs, near the Luberon region. It offers air-conditioned rooms with TVs and private bathrooms. Some of the rooms at the Logis Hotel Le Crillon have a private lounge area or a terrace. Free Wi-Fi is available in public areas of the hotel. Le Crillon's restaurant serves traditional cuisine from Provence. Meals can be enjoyed in the dining room or on the shady and flower-filled terrace. Guests can relax with a book or have a drink in the lounge. 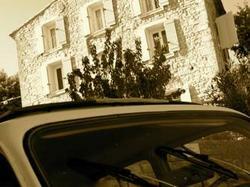 From the hotel guests can visit Gordes, Roussillon, Mont-Ventoux and Fontaine de Vaucluse. If you plan on arriving after 22:00, please notify the property in advance. Contact details can be found on the booking confirmation. A supplement of EUR 15 per additional hour will apply. Please note that dinner should be reserved in advance. This air-conditioned room features a private terrace, a flat-screen TV with cable channels and free Wi-Fi access. The en suite bathroom includes a bathtub, heated towel rail and hairdryer. This room features a flat-screen TV with cable channels and free Wi-Fi access. The en suite bathroom includes a bathtub and hairdryer. This room features a flat-screen TV with cable channels and free Wi-Fi access. The en suite bathroom includes a shower and hairdryer. This room features a flat-screen TV with cable channels and free Wi-Fi. The en suite bathroom includes a bath, heated towel rail and a hairdryer.